Amryn is one creative little girl, she loves to color and draw, a real little artist. Recently I got out a set of watercolor paints for her to try, I was a bit nervous about the possible mess, but figured since they were watercolors,and water soluable, that it would be a pretty easy cleanup. As I'm looking in the cupboard for a cup to give her some water for her brush, I had a brain storm! We have several of those plastic cups with lids that you get at restaurants with the kids meals, you know the kind with the hole in the top for a straw? I grabbed one of those, filled it with a bit of water, and stuck the paint brush in the straw hole! I took it over to Amryn and showed her how to put the brush in the hole and pull it out, and that was all it took! Even when the cup tipped over, only a few drops leaked out! I'll try to update this post later with some photos, but I wanted to get this little tip out there, maybe I can save you all from some floods! Hi everyone...it's me again...yea I know, I know...I slacked on the blogging again. Sorry! I blame it on a combination of SAHM of a 2 year old exhaustion, and writers block...but I'm going to try to get back on the horse I swear! Amryn had her first "Tiny Tutu's" dance class yesterday, which went fairly well. We were worried because sometimes when she gets around other children, well she tends to be a bit agressive with her friendliness...she doesn't hit or bite or anything like that...she HUGS and KISSES and sometimes this leads to some overzealous tackling to the ground mid hug. We reminded her in the car on the way there to not just attack people, and my hubby has been trying to teach her to shake hands, so we were pretty optimistic, and she did great! She was more interested in running around after all the other little girls than in grabbing ahold of them, and despite accidently wacking another little girl with her princess wand because they were all standing too close together and Amryn is a lefty, there were no incidents. But I must say a class of 2 year olds dancing around in leotards and tutus is so stinkin' cute! So there's a bit of an update for you all...I promise to try to get back again this week to write something of substance. I have reviews and things piling up that I need to take care of! If I don't make it back beforehand...have a happy 4th of July everyone! Friday - Here comes the sun? 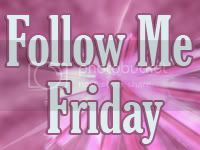 So to celebrate this lovely day, I've decided to join in on New Friend Friday, from The Girl Creative, and Follow Me Friday from Still On The Verge! Click the links below to join in! We hit 80 degrees for the first time this year on Saturday, and it was free fishing day!